Healthy skin naturally repairs itself. 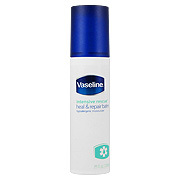 Very dry skin flare-ups are skin's way of signaling that its normal moisturization processes have severely broken down. 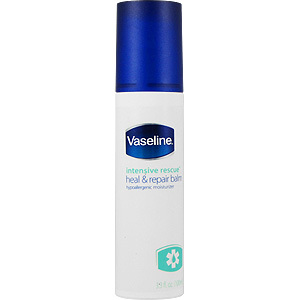 Heal and repair balm with Vasaline brand's powerful combination of moisturizing ingredients works within seconds to help relieve severe dryness. It promotes the ideal long term environment for even severly dry skin to repair itself within 5 days. water, petrolatum, glycerin, cyclopentasiloxane, caprylic/capric triglyceride, isopropyl palmitate, stearic acid, glycol stearate, sodium hydroxypropyl starch phosphate, PEG-100 stearate, cetyl alcohol, glyceryl stearate, ethylene brassylate, disodium edta, potassium hydroxide, phenoxyethanol, methlparaben, propylparaben. 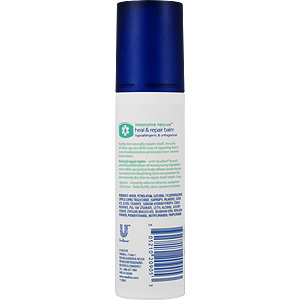 Intensive Rescue Heal & Repair Balm - is shipped in a discrete, unmarked package. Orders are processed immediately and usually take about 3 to 5 working days to be received. We do ask that you try it for 2 to 3 weeks to feel the full effects. Any information received is used only for order processing and shipping purposes. Your information, such as e-mail address, will never be disclosed to a third party.